The Tiny Book of Tiny Stories is the hard-copy equivalent of user-generated content. It's such a cool idea! Joseph Gordon-Levitt (who has come so far from his 3rd Rock from the Sun days) who is on this website, hitRECord, where people collaborate to make things, including tiny illustrated stories. 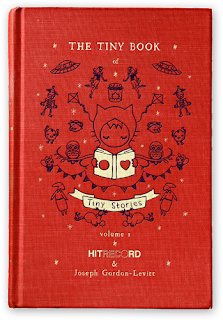 This book is a compilation of some of those stories, with the words provided by one user and the accompanying illustration provided by another. It's a very cool idea, and such a pretty book! I didn't read many graphic novels last year at all because I had pretty limited library access. This adorable book really made me miss the graphic format because the combination of prose and pictures really can hit you pretty deeply. Sometimes, I'd read the words and think, "meh," but then the illustration would be so evocative and lovely that I would then dwell on the words much longer than I otherwise would have. I am a little embarrassed to admit just how sad I was about the hopeful egg's upcoming dire end. Something about those wide-spread arms, standing at the precipice, really got to me! Another story describes how lonely the sun is because when he comes out, all his friends disappear. "It's HE-RO," the boy argued. "No," the girl insisted, "it's HER-O." I will now pronounce that word the feminist way, thank you very much! Really an adorable book that I think would work well as a graduation gift or a "just because" gift that is sure to bring a smile to someone's face. This does sound like a wonderful gift. I usually dislike the "gift book" types of books, but the examples you gave are so thoughtful. And I love the idea of he-ro / her-o. 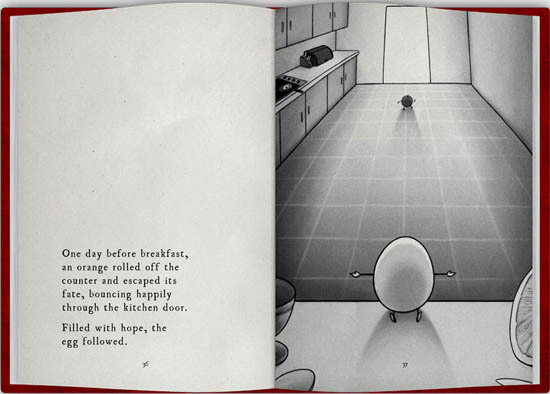 Yes, my heart just aches for the poor hopeful egg. I agree that "gift books" can generally be pretty lame, but this is a nice one to have laying on a table somewhere for people to look through, too. Like a tiny coffee table book. This one is definitely on my wishlist! And very few things go on my wishlist these days before I've actually read them. This may be one of those few books we both really love! Nooooooooooo Egg, don't do it! Yeah, this looks pretty spiffy. I say that after making a scrumptious egg curry last night. I liked this one, too. I spent some time with a fellow reader and former grad school colleague this past weekend and we talked a little bit about this book. She actually said she found it very spiritual, and I think I'd be inclined to agree! The short text+image setup was almost like reading proverbs or psalms or something! Quick bits of text that hit right in the gut. Maybe I'm overdoing it, but I thought it was an interesting take. I really, really want to read this one, and have been intrigued ever since I started seeing all the great reviews of it on the blogs. I am so glad that you loved it, and now I am sure this one is for me. I can see your anxiety for the egg. When you mentioned it, I could totally get what you were saying. Great review today, Aarti! Thanks, Zibilee! I think you'd really like this one, too. I think a second volume is coming out as well! He-ro, her-o, I'd never thought of it that way either! I know, but it's so fantastic, I love it! I was devastated by the poor little egg's choice! My favorite, though, is the one about trembling arms in the book store being the best feeling. Yes, that one was lovely, and a feeling I think so many of us have experienced before! I liked this, but I think every time I read another review I like it even more, LOL! And oh my goodness, you are so right about the egg! I don't think I had paid that much attention to that one but yes, so sad! I thought the element of surprise at the periodic table one was sad but soooo cute, in a sad way, lol. I must be incredibly hard-hearted because the egg one makes me laugh every time I see it on reviews. It is profound, but I think I've viewed it with a more "comic strip" mentality. I do want to check out the rest of this book eventually. This sounds like a perfect little book. Maybe I'll have to give in and buy it. It's a great conversation piece, at the very least! When I first heard of this book, I liked the idea but didn't expect it to wow me in any way. A short story of just a line or two? And then I read that egg story. I have to read this! Thanks for highlighting it. This sounds quite charming, and I'm curious to see if that he-ro/her-o distinction sticks with me the next time I see the word(s); I think it will!